Echinacea tennesseensis 'Rocky Top'. The upturned ray flowers is what sets it apart from other echinaceas which generally have reflexed ray flowers. 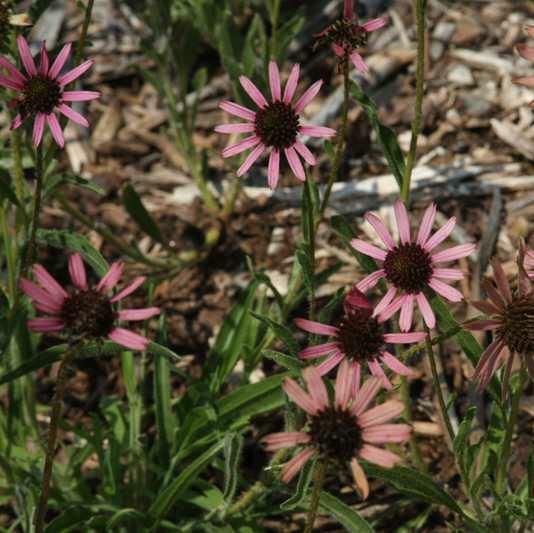 Narrow dark green leaves form the base around the pink-purple flowers with dark cones. The spent flowers remain intact on the plant and dry upright providing seed for goldfinches in winter. Once thought extinct, this rare native plant only resides in small undisclosed areas of one major city in Tennessee. While it is a federally protected plant please rest assured that our plants were not taken from the wild, but rather propagated in a greenhouse. Help save this native plant, grow one in your garden!